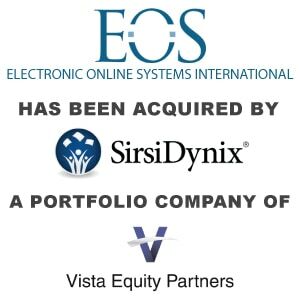 SirsiDynix Acquires EOS International Business - Berkery, Noyes & Co., LLC. LEHI, UTAH (November 4, 2013) – SirsiDynix today announced the acquisition of EOS International, a California-based technology company that develops award-winning solutions for legal, government, corporate, medical, and other special library customers. With 1100 implementations worldwide, EOS customers will join SirsiDynix customers to create the largest and most inclusive customer base in the history of the library automation industry. For over 30 years, Electronic Online Systems (EOS) International has been developing, marketing and supporting award-winning library automation and knowledge management solutions for thousands of special libraries worldwide.